Following up from my cross stitch post, I managed to whip out two easy and meaningful projects. I'm still working on my coasters, since those require alot more attention to detail it will be awhile before I share those. 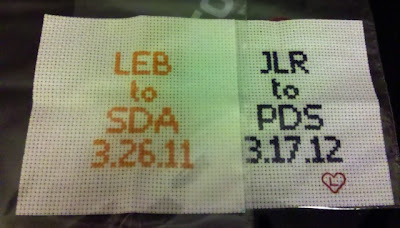 The one on right was a shower present for my friend- she is getting married so soon! I'm a bridesmaid in her wedding so I wanted to make her something special that she could keep forever. I just used an Ikea Ribba frame with a custom cut mat (love custom mats, they make inexpensive frames look awesome). 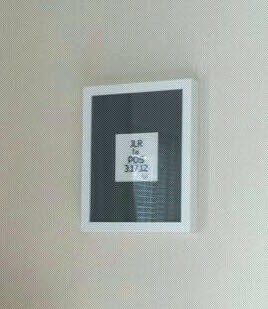 I didnt want it to be too country love, and with the modern Ribba frame I think its simple and sweet. I have to take a better photo of mine (that I JUST hung, better late than never) and I'll be sure to post that too. Fabulous! And you are right about veering too far towards country--you've done a great job at keeping the stitchery look very modern! Love these! I bet your friend was thrilled with such a thoughtful gift.